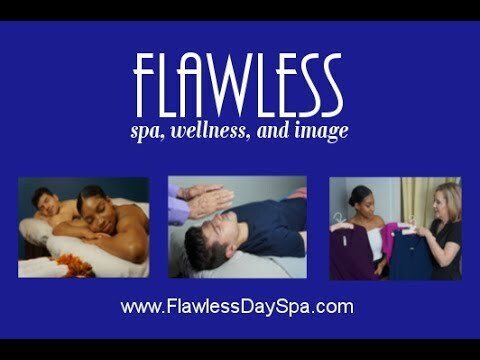 FLAWLESS spa, wellness, and image is a Chapel Hill spa and wellness center offering spa services and holistic treatments as restorative remedies that encourage the body’s natural healing capabilities. We know that busy people want and need results. Our mission is to provide a haven of peace and tranquility for our clients, with the goal of promoting the achievement and maintenance of healthy skin, healthy body, and healthy spirit. Our therapists will guide you to the right treatments to help you see visible, quick results. With an emphasis on individual consultation and clinical analysis, our expertly trained staff will provide professional treatments and a prescribed home care program. We welcome you to our spa where you will find positive energy, health, and healing. Flawless Body… Our massage therapists get rave reviews for any of our menu of fabulous massages, including our Therapeutic Deep Tissue, our Hot Stone Massage, or the Flawless Body Bliss Exfoliation Massage. Flawless Skin… Flawless offers complete menu of organic, luxurious and results-focused facials and treatments such as the signature Customized Organic Facial, microdermabrasion, and various chemical peels. Flawless skin isn’t a matter of luck, it’s a matter of science. We help make science beautiful! Flawless Products… We offer the finest organic skincare and body care products from Hungary. The Eminence line offers a range of high-quality biodynamic products that will nourish and feed the skin. Our treatments will melt away stress, leaving you relaxed and renewed. Flawless Beauty… We offer cosmetic makeovers to enhance your natural beauty for that special occasion or any day. And you can take home your favorite Glo Minerals products, a pharmaceutical-grade mineral makeup. If you want unsurpassed coverage, broad spectrum UV protection, and the power of antioxidants, we have you covered! Flawless Image… Your image is important, and we offer the image services that will help you pull together a cohesive style, look slimmer, and feel more confident. Flawless spirit… We offer a variety of holistic healing modalities to serve you. We feel that nothing exists in isolation. Every interaction – our thoughts, past, diet, work, relationships, even the weather – has an impact on our health and serenity. There are many factors that can contribute to any imbalance. We offer our awareness, skills, and experience to facilitate changes that can lead to personal healing and a higher quality of life. We value each person who enters as a sacred individual, and hold this space as a welcoming, nurturing, safe, and healing sanctuary. We are rewarded by the wellbeing you experience.